The base harbour port facility of Gwynt y Môr Offshore Wind Farm. Image courtesy of Rept0n1x. Cheryl Gillan MP with a worker of Gwynt y Môr Offshore Wind project at BiFab. Siemens 3.6MW wind turbines are installed at the Gwynt y Môr offshore wind farm. Image courtesy of Siemens. The Gwynt y Môr offshore wind farm consists of 160 Siemens wind turbines. Gwynt y Môr is a 576MW offshore wind farm located in the Irish Sea, Liverpool Bay. Located 14km off the north Wales coast, the wind farm covers approximately 79km² of a site leased from the Crown Estate. It is located close to North Hoyle and Rhyl Flats offshore wind power facilities. The €2bn ($2.43bn) project is owned and developed by a joint venture of RWE Innogy (60%), Stadtwerke München (30%) and Siemens (10%). The project received environment approval from the UK Department of Energy and Climate Change (DECC) on 3 December 2008. Its construction started in January 2012 and was completed in approximately three years. The wind farm was officially inaugurated in June 2015. It will produce 1,950GWh of clean energy a year, which will be enough to power 400,000 households, equivalent to cutting 1.7 million tonnes of CO2 emissions a year. Unexploded bombs from the World War II times were found in the seabed near the site of the wind farm. RWE disposed the three unexploded ordnance devices with the help of 6 Alpha Associates. "The offshore facility will produce 1,950GWh of clean energy a year, which will be sufficient to power 400,000 households." The wind farm is situated in water depths ranging from 15m to 30m. It uses 160 Siemens SWT-3.6-107 wind turbines rated at 3.6MW each. The turbines are supported by monopile foundations, with each one consisting of a 5m diameter steel tube measuring 50m to 70m in length, and weighing from 500t to 700t each. 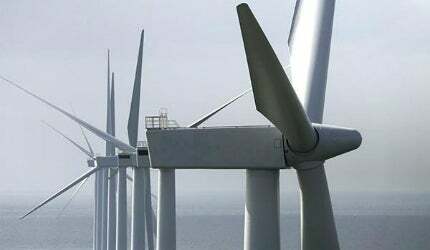 The turbines have a rotor diameter of 107m, a hub height of 84.4m, and an overall height of 137.9m to blade tip. Stanislav Yudin, a crane vessel with 2,500t lifting capacity and fully revolving crane, was used to install the 800t, 42m deep jacket foundations at the offshore substations. The installation of turbines started in the fourth quarter of 2011, with offshore cable installation starting in 2012. The first turbine was installed in May 2013 and 107 turbines were installed by the end of 2013. "The power is transferred further to a new onshore substation located at St Asaph through 12km onshore export cables." Output from the wind facility is transmitted to offshore substations via subsea cables, then to an onshore substation through export cables, and finally to the National Grid through onshore interconnection cables. The offshore transmission infrastructure includes two offshore substations of 33kV and 132kV, 33kV inter array cables, four 132kV export cables and up to five meteorological masts to monitor and control the wind farm. The 20km offshore export cables link the offshore substation with landfall. The power is transferred further to a new onshore substation located at St Asaph through 12km onshore export cables. The St Asaph substation feeds the wind farm’s output to the 400kV national grid. The wind farm generated its first power in August 2013, which was then exported to the St Asaph substation. Twenty five 3.6MW wind turbines have been installed at the 90MW Burbo Offshore Wind Farm in Liverpool Bay, Wales. Siemens supplied, installed and maintains the wind turbines, and also provided electrical connection to the grid under an electrical systems contract worth €1.2bn ($1.45bn). RWE awarded a contract to A2SEA for supplying its jack-up vessels, Sea Jack and Sea Worker to install the wind turbines, generators and blades. Fugro Seacore was selected to design, construct and install the 90m-high steel lattice mast and the monopile foundations. LDD, an offshore drilling and marine construction contractor, provided drilling services to secure the installation of the steel monopile foundations. Manchester-based Granda Materials Handling manufactured 164 separate crane units for the wind farm. Draka supplied 148km of three core 33kV cables in 2012 and 2013 with essential accessories and logistics solution, under a €25m ($30.39m) inter-array cabling contract. UK-based Global Marine Systems was awarded a multi-million pound contract to install the offshore export cables. The onshore 400kV transformer substation at St Asaph was constructed by Jones Bros. Construction started in November 2009 and was completed by 2013. Scotland-based Burntisland Fabrications (BiFab) signed a £12m ($19m) contract to design and manufacture the foundation structures of the substations. Prysmian Cables and Systems supplied 134km of high-voltage onshore cables for the wind farm, under a £15m contract. The cables are attached to the offshore network at Pensarn and routed to the St Asaph substation via underground. CT Offshore was awarded the contract for free-laying, installation and burial for 63 cables of the 161 inter-array cables. Reef Subsea Power & Umbilical was awarded a contract worth £15m for conducting inter-array power cable installation and burial. The consortium of Bladt Industries and EEW Special Pipe Construction was awarded the contract for manufacturing the wind turbine foundations. The contract for providing drilling and pile installation services for the foundations was awarded to LDD.